This little guy is all dressed up for his graduation. So soft and cuddly he should get a degree in CUTENESS! Standing approx 50cm tall (32cm sitting), he wears a graduation gown, a hat and a little yellow ribbon. Add a personalised Graduation message with name and “Class of (year)”. 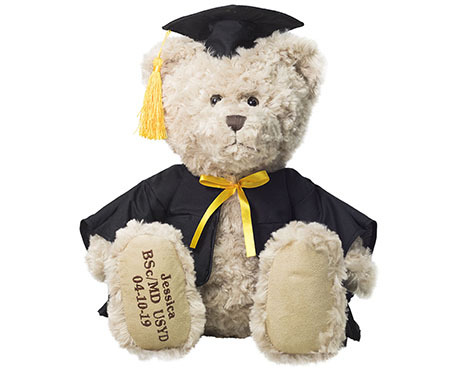 This graduation teddy bear is the perfect gift for this “special” occasion!! Your teddy will arrive beautifully wrapped in tissue paper and packaged in a special box.